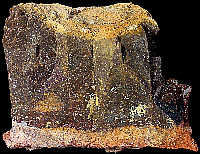 Mode of occurrence: Occurring in continuous beds 5 to 6 cm thick, highly jointed, jutting out from the compact light brownish grey to light reddish tan limestone. Lower layers of an outcrop at the top of a cliff face. Cortex: Fresh, rough, light pinkish tan, 0.5 cm, transition sharp. Colour: Dark reddish brown (5YR 3/2). Pattern: Abundantly flecked with pale-coloured specks. Structure: Faintly laminated, with a fluidal arrangement of grains. 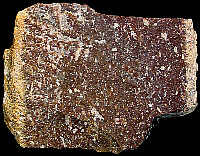 Grains: 90 %, pale or more generally highly impregnated by iron oxides, rounded with high sphericity, a few cubic elements; main grain size 500 µ (ooliths), with others ranging between 1000 µ and 2-3 mm. Grain composition: Mainly ooliths, plus pelecypod fragments, sea urchin radioles, entrochi, serpulid sections, and numerous Cyclostoma bryozoans; a few clasts. 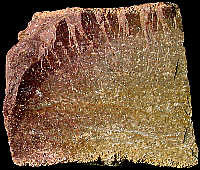 Other types of flint: This source consists of three seperate banks of flint in a fining-upwards sequence. 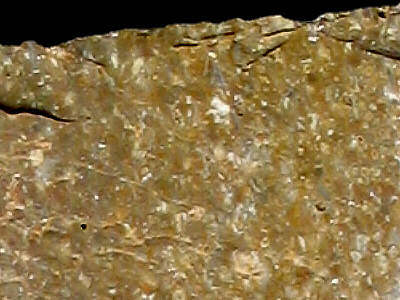 The lowermost layers yield the grainstone of type Bj4c, described on this page, the middle material is the packstone of type Bj4b and the upper layers contain the Bj4a material, with a wackestone texture. Geographical description: The source lies on a hilltop approx. 1 kilometre east of the hamlet St. Germain, a couple of kilometres southeast of Ambérieu-en-Bugey. Co-ordinate precision: The coordinates given were taken from a large-scale map, and are within approx. 50 - 100 metres of the actual spot. Geology: The underground at the sampling-site is a clay-with-flints which resulted from the decalcification of several flint-bearing formations dating to the Bajocian and Bathonian (units J1a-b and J1c from the Bajocian and J2 from the Bathonian). Other types of flint: Besides type Bj4c, this residual source also yields Late Bajocian flints of the Bj3 variety, as well as Bathonian flints of the types Bt1, Bt4 and Bt.